Brew time in the workshop so have a sit down and a read for five minutes with this latest news update, hoping we don’t bore you too much. “The 1st and 2nd of September we returned to Blowering Dam for more tests. This was the first time Spirit of Australia II used the full course on the Dam. That is to say commence start, build up speed getting her on to her planing points, through the measured Kilometre and run out the other end, then decelerate until she comes back down off the plane.. around 7 to 8 kms in total. It was also my first trip to Blowering Dam without dad with me (Ed: current Outright World Water Speed Record holder Ken Warby MBE), as he had business commitments in the States where he lives, plus he was in Australia only 3 weeks earlier for the Sydney International Boat Show. 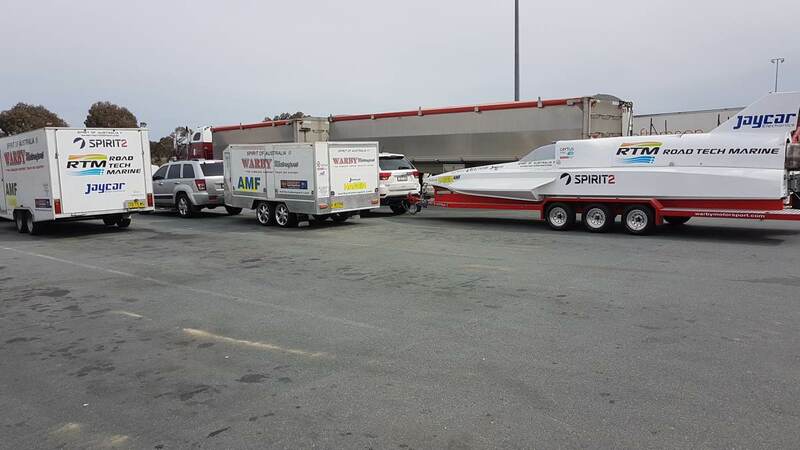 This would also be the first time the team would practice refuelling, servicing and restart of SOAII out on the water at the far end of the dam, which is required for the Outright World Water Speed Record (wwsr) attempt. Now the boat is constantly running in the low 200mph speed region we need clear relatively smooth water, a small chop of surface waves is fine, however in previous tests we would run up and down half the length of the course a few times in one outing, which would end up being affected by the boats own wake. Fine for testing to speeds of 150 to 180mph with SOAII, but now with higher speeds we need to ensure we have calm & controlled water. As the Dam level had been raised by 20% in recent months we found that there was quite a bit of debris in the water so State Emergency Services spent the morning clearing the far end of the Dam of what debris they could see. By lunchtime we had clearance to run the boat. Our first run out was to ensure that I could see my land markings from each end of the Dam and to make sure I was on course. 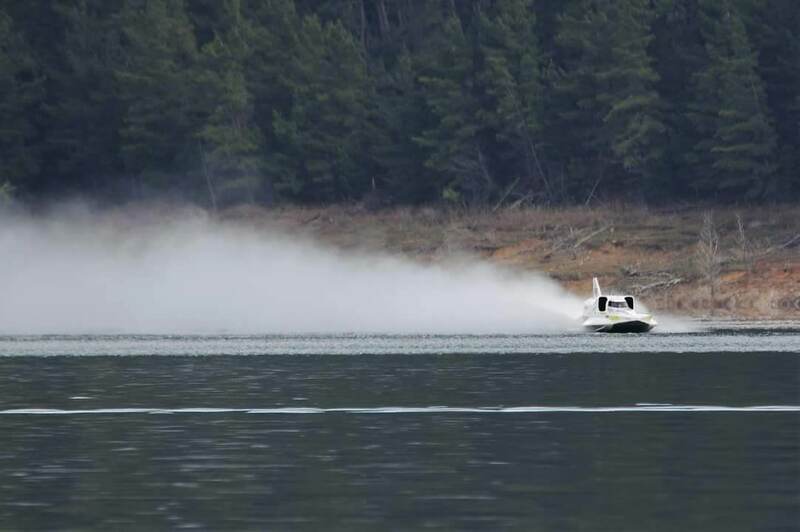 The second run out was at higher speed (206mph), with a successful on water refuel, service and restart at the far end of the Dam but during the run it revealed the water was rough mid course. The Sunday morning we prepared the boat for a run and given clearance to put the boat in the water. The first run down the course the boat accelerated from 150 to 200mph easily, at 218mph I felt the boat veer to the left slightly and a bit of weight on the steering wheel. I backed off slowly and didn’t try to straighten the boat back on course as I thought something was wrong. I reported this back to base on our radio comms channel so the service team at the far end of the Dam could check the rudder and around the hull for damage. However no issues with the boat could be seen by them from the limited inspection they could undertake from their support boat out on the water next to SOAII, so after consulting with our Crew Chief (veteran Royal Australian Air Force pilot Phil ‘Frawls’ Frawly), I said that I would drive back up the course with caution and feel how boat reacted under acceleration. Once serviced and water clearance given, I went through the restart of the Orpheus jet engine and started on the return run down the course. I felt the boat’s steering was off centre slightly at 120mph, then slowed the boat to around 90 mph and advised base via the comms that I was on my way back to the start and shoreline launch ramp. As I started to come in towards the launch / recovery ramp I tested the steering from side to side and it just didn’t feel balanced. Once the boat was lifted out the water by the recovery crane it was clear we had hit some debris out on the water on our first run of 218 mph. The backing plate of one of the front fins that keep the boat on track under each forward sponson had been bent back at around a 45 degree angle. There was also some marks on the inside of the air-trap that occupies the space between the front sponsons where something had hit the boat. We deduced that as the backing plate was bent, this allowed the left hand fin to flex slightly, which in turn was making the boat pull to the left and that was why I could feel it on the steering. Unfortunately that damage ended our weekend of testing, as we couldn’t repair the boat on site, plus we needed to check over the complete steering system with the craft stripped down back at our base to ensure there was no other damage. Overall the boat continues to improve each time we run it. We are still chasing the setup of the boat slightly but this is only fine tuning with balance & drag. Minor changes are clearly having a positive result as the speeds continue to rise with a safety first approach. We will return to Blowering Dam at the end of November and provide a further update to Dave Aldred to relay on this website of how we get on then”. 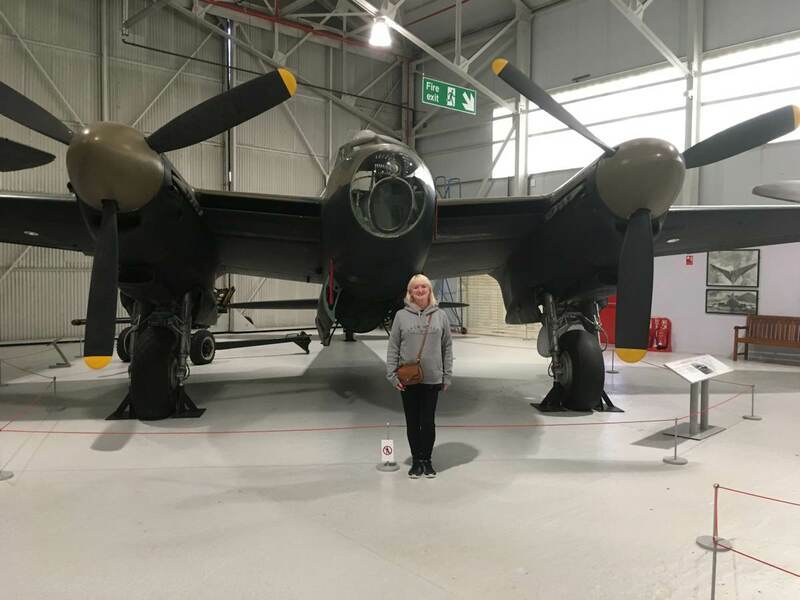 Meanwhile DJ our future driver of Longbow, has been continuing his military flying examining role on the Central Flying School, which included a recent liaison visit to the Saudi Arabian Air Force Academy in Riyadh, in an attempt to escape the recent British heat wave. Closer to home he continues to fly vintage aircraft in his spare time, and recently qualified on the 1950s Russian L29 Delfin jet, which was the lead-in trainer for the MiG 15. The Delfin is powered by a centrifugal flow turbojet engine very similar in design to that which propelled John Cobb’s Crusader jet hydroplane and Sir Malcolm Campbell’s experimental Bluebird K4 jet conversion. 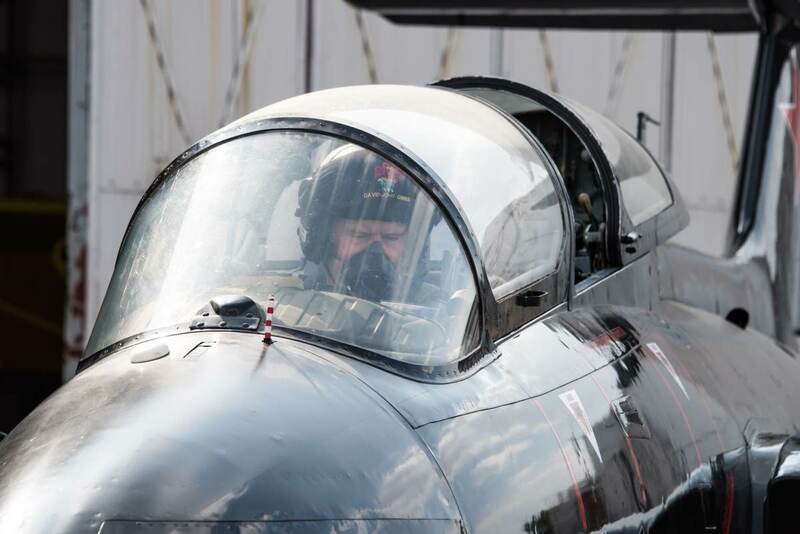 This vintage jet engine experience will be invaluable as he along with our gas turbine engineers undertakes getting our twin Viper jet engines that will power Longbow in ‘ground running’ condition to prove the engine systems prior to installation in the boat. A query was recently raised on social media about why we were building the hull of Longbow from timber, why not modern carbon fibre composite like the late Daniel Dehaemers’ SP600, or as in the case of Bluebird K7, all metal, as surely wooden hulls are only for runabouts and simply not up to the job for an attempt upon the Outright Water Speed Record? I even remember design engineer, the late Ken Wheeler who was involved with both Bluebird K7 and Longbow saying his initial thoughts on wood being it is for sheds not jet hydroplanes, so what managed to change Ken’s opinion? Well in truth if time and money were no object any, or indeed a combination of the above materials, could be used for a jet hydroplane attempting this Record at its current mark, or a reasonable progression up from it. However in the case for wood let us not forget that the Record has been held by a timber hull in the form of the original Spirit Of Australia since 1978 and the two attempts since that time of where one construction was primarily composite (Rain X Challenger) and the other, all metal (US Discovery II) both ended in fatalities, as did the all metal constructed Bluebird K7. 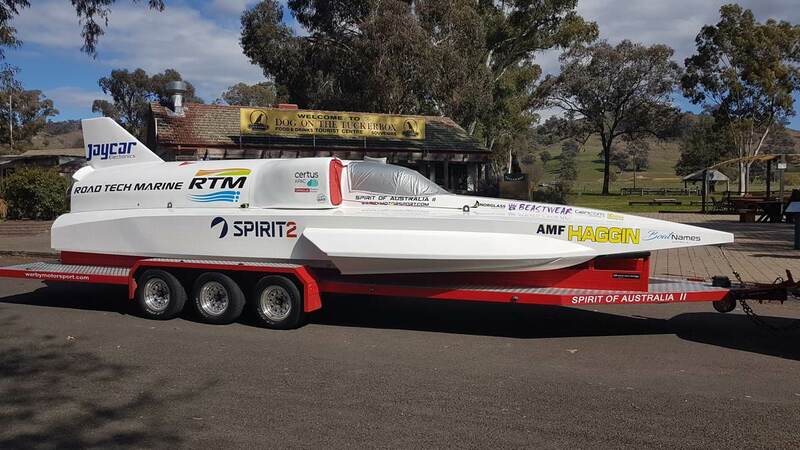 Furthermore the previous record holder to Spirit of Australia was the jet hydroplane Hustler at 285 mph which again was a traditionally built timber hull. 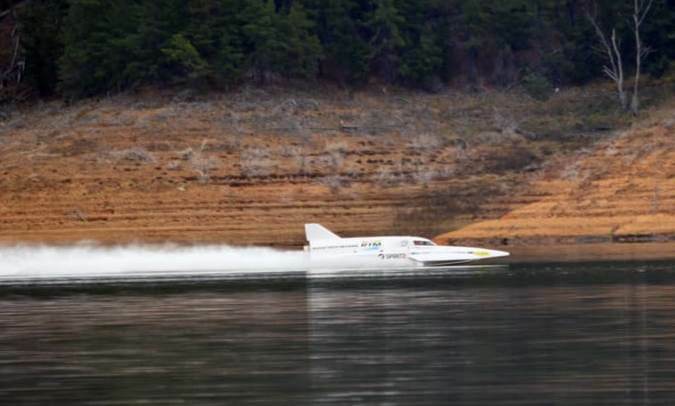 So in summary the two last jet hydroplanes to hold the Outright Water Speed Record have both been timber hulls as have been a good many craft prior to that. Out of interest we did go out to tender for the cost of forming a primarily carbon fibre composite hull for Longbow and at the time that came back for a sum of around £270K, excluding the driver cockpit capsule which would be at additional cost. Whilst that is a considerable amount of hard cash to find it wasn’t just a question of money, there were other factors that came into play as to why we opted for wood as our choice for the hull of Longbow. As indicated by the above we know that a timber hull is more than capable of running at Outright World Water Record speeds by the two previous Record holders being timber construction. 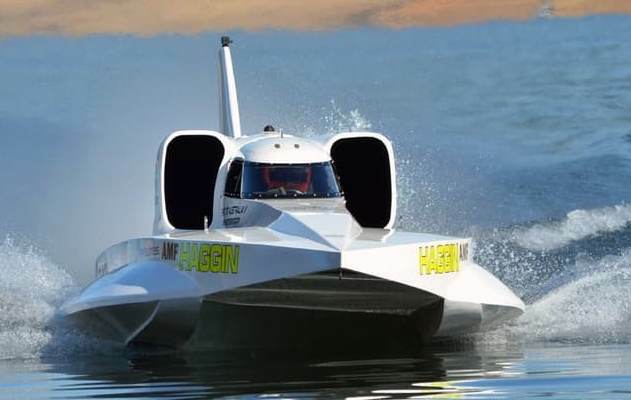 This is not at all unexpected when one considers wooden ships have coped with mountainous waves in storms out at sea and were used for unlimited hydroplane circuit racing running over not only their own wash but that of all the other competitors. An Outright World Water Speed Record jet hydroplane is running upon relatively calm smooth inland water, there are no other boats it is being raced against at the same time, to cause wakes or washes for the boat to travel over and it is merely kissing the surface of that water as it planes over it. If we were making a carbon composite hull, that would require a plug to be made first and in the case of say the SP600 jet hydroplane the former for that plug was made in wood so you are in effect going to all the trouble of making a wooden hull to take a mold from it. In the case of a continuous hull and riding surfaces where it is all formed as one continuous piece it is also very difficult (and expensive) to then make significant changes to that hull should they be found to be required at later date from proving trials. A timber hull in comparison is very easy to adopt such changes. Furthermore unlike wooden hulls, damage and water absorption to composite hulls is not very easy to detect and fixings are difficult to retrospectively install should changes be required at a later date. Metal hulls tend to be inherently heavy and as a result for example in the case of Bluebird K7, they typically require high angles of attack to facilitate getting all that weight from their static displacement stage up on to their planing shoes. These high angles of attack at the front of the craft become increasingly undesirable from an aerodynamic point of view the faster the boat travels, when we are obviously wanting to reduce the risk of the craft lifting completely off the lake surface and blowing over as much as possible. All metal hulls are also not without problems to heat effected zones where they are welded, corrosion of different types both upon their external and internal surfaces, in addition to stress failures including around where riveted construction. We then come on to the case of what if an accident were to occur to the craft whilst travelling at speed, with a resultant compromised hull that has possibly lost engine covers, elements of floatation, or compartments having been ripped open allowing water to enter the hull during say a blow over, or roll situation. 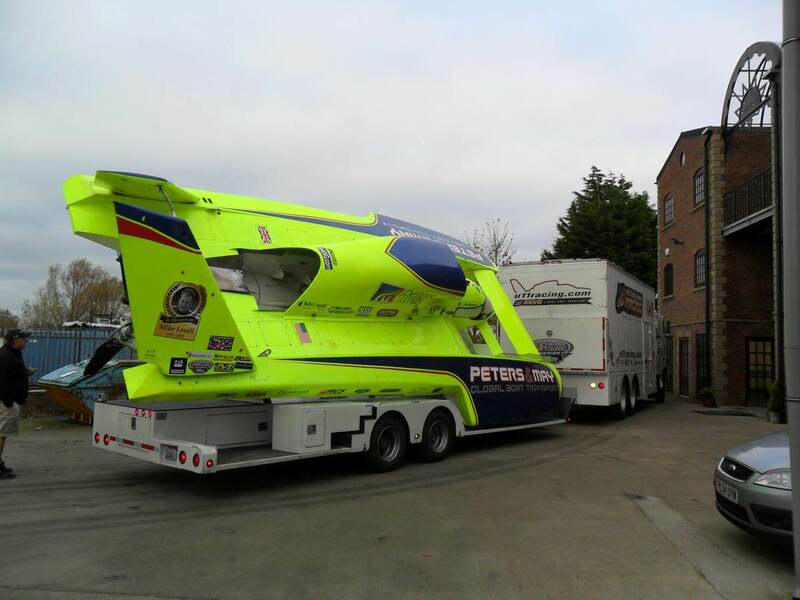 There is a considerable difference in design of say an Unlimited circuit racing hydroplane (as shown below) carrying a relatively small turboprop gas turbine in a wide large hull built to go around corners and an Outright Water Speed Record breaking pure thrust jet hydroplane going as fast as possible in a straight line. The design of the former lends itself to the cockpit remaining integral to the hull as there is considerable volume within that hull to provide sufficient buoyancy to keep the craft upon the surface even if partially compromised. In comparison larger heavier pure thrust gas turbines necessary for the speeds required within a relatively sleek narrow hull to keep aero lift and drag to a minimum for Outright Water Speed Record attempts may well have insufficient buoyancy to what remains of that damaged hull to keep it supported upon the lake surface such that it sinks. If the driver cockpit is integral to that type of hull not only will the compromised hull be at risk of sinking but it would also take the driver with it to the bottom of the lake with likely fatal results irrespective of any breathing system they may have on board. For those that might suggest why do we not just have an ejector seat for the pilot as used in some military aircraft, yes we did approach British ejection seat manufacturer Martin Baker for consideration of such an option. They very kindly responded at the time that apart from the considerable research and development cost, a seat that ejected from ground level was in theory quite feasible but unfortunately they would not be able to support the concept as there was no guarantee that the direction of ejection would be vertical. That is to say if the seat fired off at an angle towards the shore the potential liability to a third party for them as a company would be unacceptable. We are therefore left with the choice of either the pilot cockpit remaining integral to the hull, hoping there is sufficient buoyancy to keep what remains of that hull and cockpit post accident upon the surface whilst rescue arrives, or as is used for drag boat racing, where crashes are often at much higher speeds than Unlimited circuit racing, the hull sacrificially destroys itself should a catastrophic accident occur and in so doing release the driver within their composite capsule. The latter having sufficient floatation within that capsule to remain upon the surface of the lake with driver even when fully flooded. In this respect a timber hull with separating composite driver capsule fulfils the latter design requirement. With a recorded speed of 428mph, for that aircraft being well above that of the current Water Speed Record of 317mph, the airframe was constructed from plywood, balsa and spruce. In our case the marriage of engineered wood with formulated resins yields a hull that is lighter, stronger and more durable than a traditionally built boat. Cold molded construction requires the least in highly technical and expensive construction allowing limited finances to be better spent on other aspects of the build. 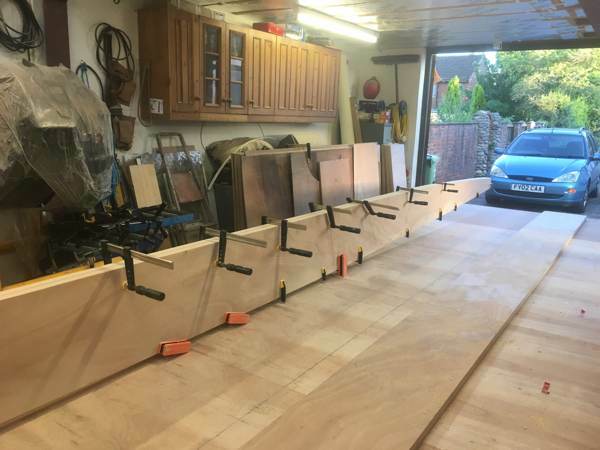 Then of course there is no getting away from the fact that working with wood is so very rewarding, along with the amusing comments from Steve our timber craftsman of everyone knows that wood floats, so why build a boat out of anything else. Just remember the strongest case of all for us choosing a timber hull being the Ark was built in wood by amateurs, whilst the Titanic was built in metal by engineers! Joking apart having answered the issue of why we chose wood for the hull, we had better show you the next stage of the build from where we left off in last month’s diary update. If you have been following the venture you will recall that we had formed the three raw lengths of stringers / engine bearers which act as the backbone to the hull. We had also widened and levelled the steel grillage that was used to initially form those bearers into a table that was sufficient to build the hull of Longbow up from. These stringers in their raw form are essentially three long narrow rectangles of engineered laminated timber. We need three of them because in our case we are uniquely running twin Viper jet engines side by side, so one stringer runs down the centre between the two engines and the other two stringers will wrap around each side of the two jet engines. For anyone who thinks this is simply copying somebody else’s design, let me put this one to bed from the outset, because running twin pure thrust jet engines within a hydroplane designed to attempt the Outright Water Speed Record, has never been done before and with such a ballsy design has come a whole host of issues that we have had to fathom out and work each problem through as it presents itself. 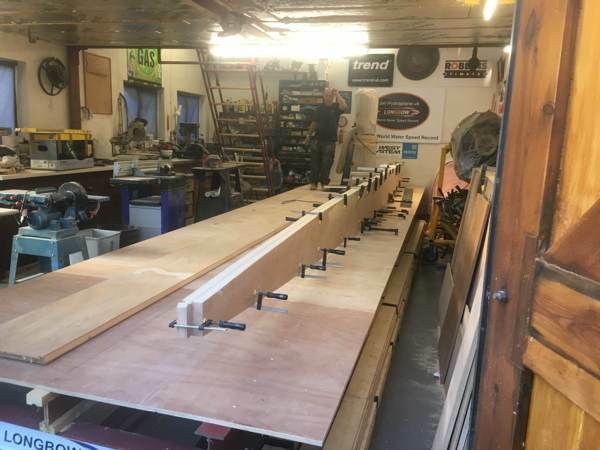 The next job was to cut the stringers to the required profile because their finished shape dictates that they be narrower in height to both bow and transom. Nothing complicated, just print each section of them out on AO paper full scale, follow the dotted line with scissors and trace that shape onto the wood. A steady hand with the saw, then sanding and voila we had three stringers. 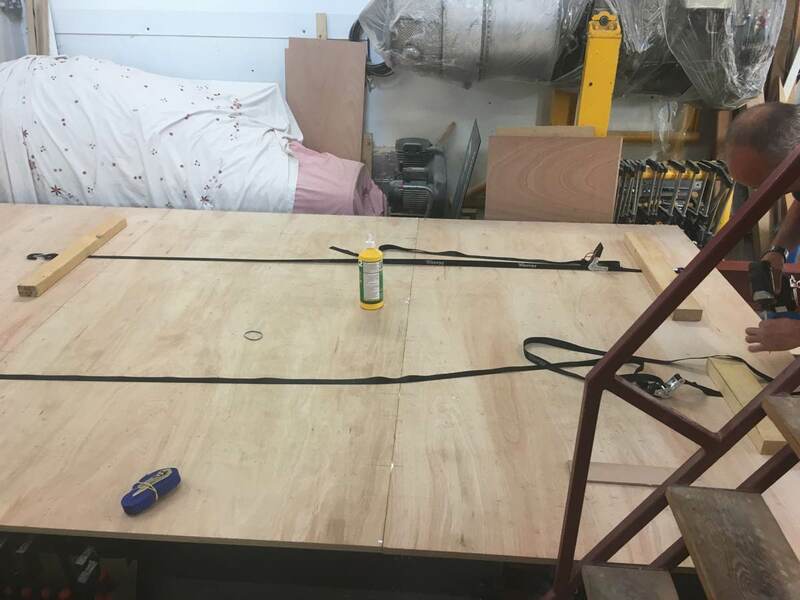 Following on from that we marked the build table out for where the stringers were to be located within the hull and made temporary timber formers including a back board so we could then set the stringers into their finished vertical positions relative to each other. Of note and for future reference the hull at this stage is being built upside down because it is the underside of the hull we need to construct first. In next month’s update we will discuss timber selection and use of resins, along with revealing the next stage of how the build progressed. 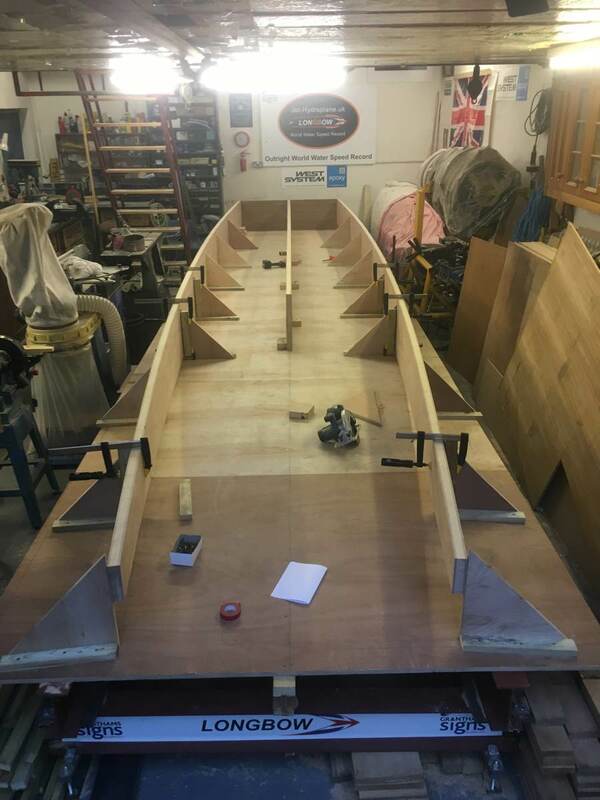 Thank you for tuning in to our little venture as Longbow begins to take shape and we hope you spread the word that this is a project worth following, to which people at home can relate to and see actually happening for this most credible British Attempt upon the Outright World Water Speed Record.